While there are no native functions or plugins for QGIS that will automate the creation of a non-contiguous cartogram, here is one proposed workaround for creating such a map using data defined labels. 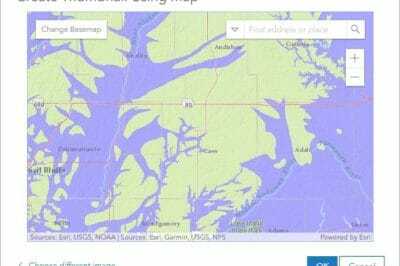 The following QGIS tutorial is adapted from a non-contiguous map experiment created by Kenneth Field using ArcGIS. This article presents a rough idea of how one might mimic a non-contiguous cartogram using QGIS. For those that want to follow along with this tutorial, a .zip file containing the state polygon, car theft point file, and QGIS Layer Style File is can be downloaded here: car-files. This map process involves using label points in order to create the illusion of a non-contiguous cartogram. The first step is to set the base map which is a polygon layer of the individual states. While it’s not necessary to include a base layer, I chose to do so in order to provide a spatial comparison of the state features. 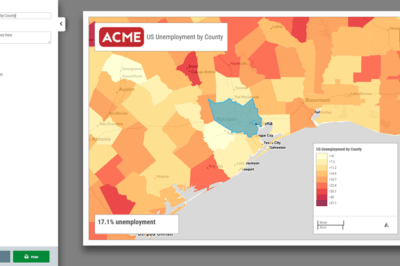 The state layer I used was a shapefile downloaded from the US Census Bureau. From the state layer, we want to extract the centroid for each polygon. To do so, go to Vector –> Geometry Tools –> Polygon Centroids. From the GUI, make sure that your state layer is selected as the polygon and then browse to the folder where you want to save the newly created point layer and give it a name. The new point layer will automatically be added to QGIS as long as the “add result to canvas” box is checked. 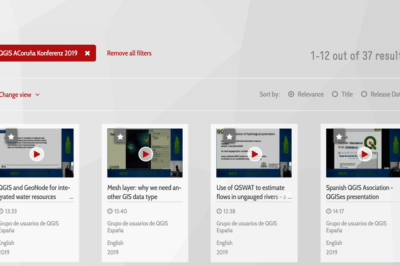 In the GUI, search for MMQGIS, click on the plugin and select install plugin. Now you can join the car theft file. 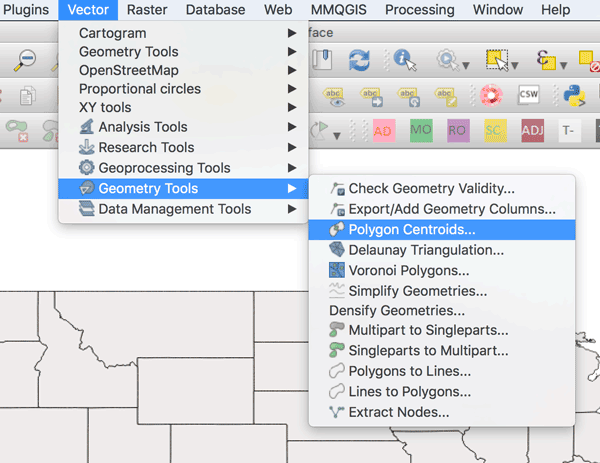 To do so, go to MMQGIS –> Combine –> Attributes Join from CSV file. In the attributes GUI you will need to first browse and select the CSV file. The select the field in the CSV file that has the state name. Next select the point layer and select the field name that contains the matching state names. Finally, type in a location and name for the joined shapefile and the location and name of the file containing any unmatched data. 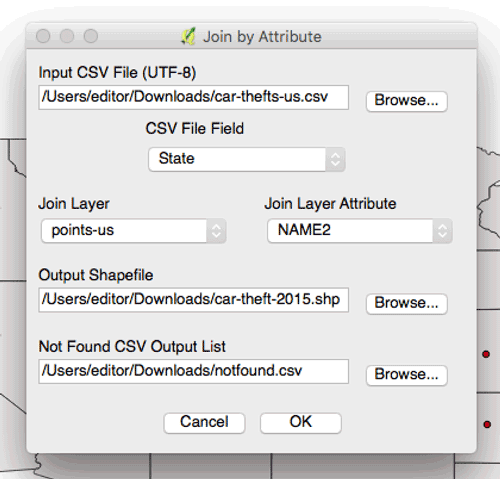 Hit OK and the new shapefile with the joined attributes will be added to the canvas in QGIS. Now it’s time to stylize the map to mimic a non-contiguous cartogram. Once you have downloaded and installed the StateFace font on your computer, you can now create a field that links the state shape to the keystroke. The easiest way is to create a CSV file containing two columns, the first being the state name and the second with the corresponding keystroke. You can then join this to your car point file. Click on the “+” to see the table. 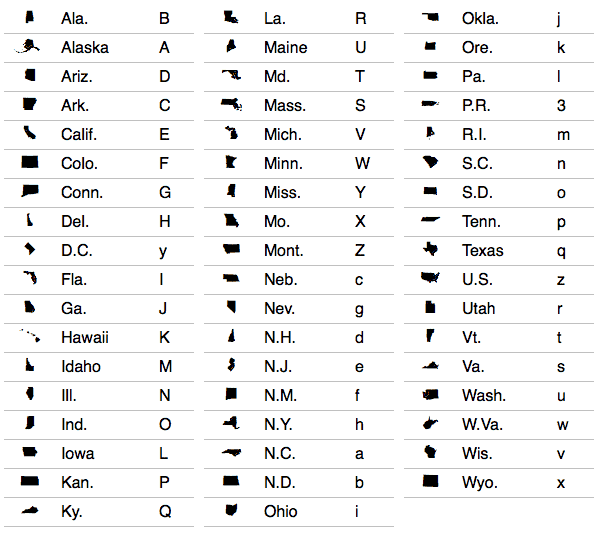 Now you’re ready to label your point file with the state shapes. To do so, right click on your point layer and select properties. In the properties window, select style. 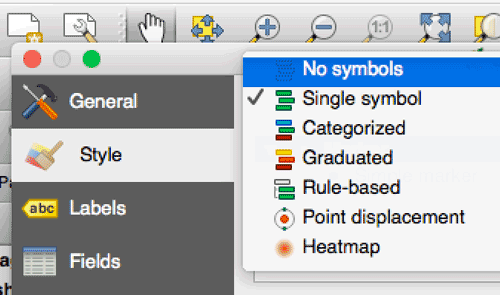 Turn off the styling for the point shapefile by selecting “No symbols” and hit apply. Keep the property window open for now but you should notice the points disappear from the canvas. Now we want to select StateFace to be label used for this layer. Right below Style select the Labels menu option from the properties window. First select “Show labels for this layer” (1). Then select the field that contains the keystroke information for matching the states to the corresponding StateFace font (2). Finally, select the font as StateFace (3) and hit OK. Using the values in this field, I can create data defined conditions for how large the StateFace font should be. To do so, go back to the layer properties –> labels and select the icon next to the font size box. Then select “Edit..” under Expression. 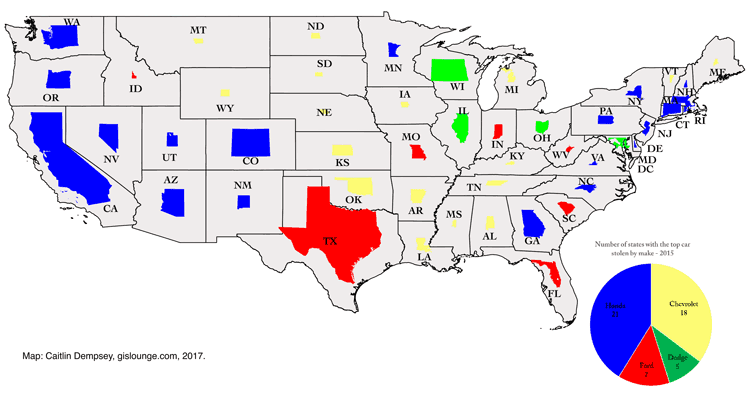 You should now see your map with varying sizes for each state shape. You can adjust font sizes by changing the numerical value after each THEN to increase or decrease. Now let’s change the font colors based on the number one type of make stolen from each state. Head back to the label section in the layer properties. Select the icon next to the font color box and then edit to pull up the Expression dialog box. Again, use a CASE statement to read attribute values from a the Make field to change the font color. The font values listed here are RGB. 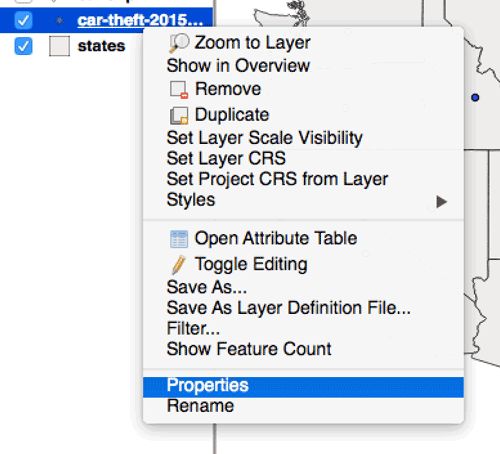 Hit ok and now the layer is color coded to you can see patterns of which car make is the most stolen in each state. Notice any geographic patterns? Finally, add any map elements to your map such as labels, title, etc. As my legend, I created a pie chart in a separate application and then added that as an image in Composer. A lot of manual tweaking can be incorporated to move any overlapping features if desired.